Corel Painter has been around for over 20 years, yet I still remember getting the original version, literally packed in a paint can. Digital imaging was a little more magical back in the day, but today the output is remarkable and anyone with a desire can learn enough to turn out marketable work in short order. While I instantly gravitated to Photoshop, I always found Painter to be a little more elusive. Those with actual art experience seemed to ‘get it’ and were producing enviable art in no time. Well, now with this book by Daryl Wise and Linda Hellfritsch, you get to virtually sit in the studio of 17 different digital artists and glean from their experience and workflow. I was particularly drawn to the landscape photography of John Derry, one of Painter’s founders as well as the portraiture of Jane Conner-Ziser, a Canon Explorer of Light and expert retoucher. 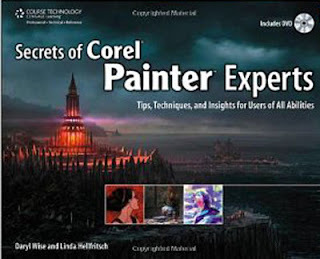 If you’ve never used Corel Painter before, this is not a beginner’s guide. Tools and techniques are not explained for the novice. However, if you’ve used Painter before, and are interested in taking your work to the next level, there are some dynamite ideas included. In addition to the discussion of ideas and techniques by each artist, there are step-by-step lessons and samplings of their other work. A DVD accompanies the book with even more resources. If you are serious about advancing with Painter, this ought to be on your shelf.